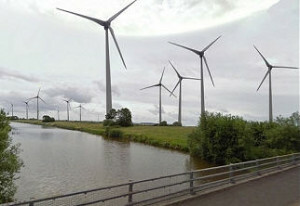 December 10, 2010 – The Royal Society for the Protection of Birds (RSPB) has written a letter of objection regarding the proposals by Ecotricity to build four wind turbines, each with a maximum overall height of up to 120m, on land at Poplar Farm, West Huntspill. Richard Archer, the RSPB’s Somerset and Severn Estuary Conservation Officer, has written to Sedgemoor District Council expressing his concerns. Mr Archer adds that Ecotricity has agreed with the RSPB, Natural England and Somerset Wildlife Trust to carry out a full radar survey of migratory birds at the site this winter in order to get a better understanding of bird movements. EDF has also agreed to carry out a similar study at the nearby Withy Farm site. Mr Archer urges Sedgemoor District Council to delay a decision on the application by Ecotricity until the results are known and says that the RSPB is objecting to the proposals until the study’s results have been received. Video of a bird being killed by the moving blades of a wind turbine was shown to an audience of 100 people at a wind farm protest meeting near Burnham-On-Sea in November, as reported here. “As with many things at the moment in the UK, the radar system used is being affected by the severe weather so, after speaking with RSPB and Natural England, the work will be delayed until January. We were aware that RSPB intended to place this holding objection on the application in the meantime, which will be reviewed once they have seen the newly collected data.”The Royal Society for the Protection of Birds has written a letter of objection regarding the proposals by Ecotricity to build four wind turbines, each with a maximum overall height of up to 120m, on land at Poplar Farm, West Huntspill.